You're playing in a multiple deck game where the dealer must stand on soft 17. You're dealt and seven and a five for a hard total of 12 while the dealer has a two showing. What is the correct move under these circumstances? This situation understandably causes problems for some people. 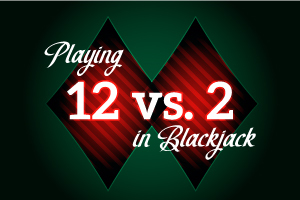 The dilemma is that if you have a 12, there's a certain chance you could bust with a ten-value card since there are more ten-value cards in the deck than any other denomination (16 per deck, of course). The dealer also essentially needs to draw a couple of ten cards if he or she is going to break. Remembering logistically that odds are against this happening, since non-tens outnumber ten value cards in the deck by an average of 2.25 to 1, what you need to do here is improve your hand. If you NEVER hit the hand, you're going to lose approximately 65% of the time, without question. If you hit the hand, you'll lose only about 60% of the time. Therefore, you LOSE LESS, and you're in effect playing defensively. You will win the hand at about the same rate, and granted, you certainly will bust some of the time, but keep in mind also that you will wind up tying with the dealer at about a 5% rate, meaning your original bet gets returned to you; money you would otherwise lose by not hitting. Take only one hit though, as anything further will take you out of proper Basic Strategy.